The best bars are filled with beautiful women sipping on hand crafted cocktails. Women bring men which brings conversation, fun and business. This cocktail is for the ladies. 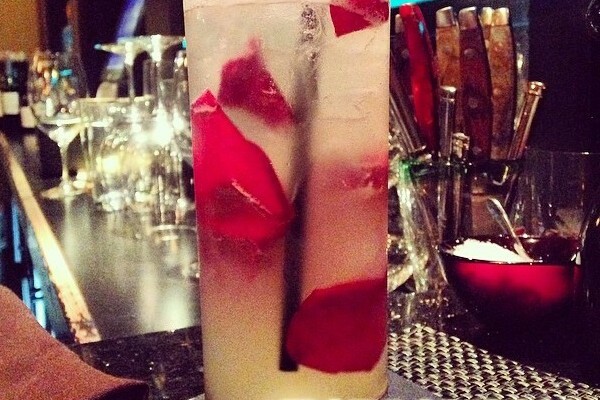 Rose petals are still foreign in most bar settings, so they’re sure to catch the attention of your female guests. Procedure: In a mixing tin add your Tanduay silver rum, lemon juice, Finest Call Bar Syrup and Fee Bros. Rose Water. Fill the tin with ice and shake vigorously. Strain your mixture into a Collins glass filled with fresh ice. Top your cocktail with champagne (or sparkling sake) and gently stir in the rose petals. Garnish: Rose petals and sugarcane if available. 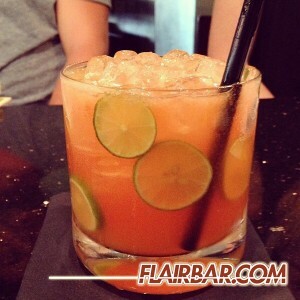 Napoleon’s Green Market is a cocktail I created for Max’s Harvest in Delray Beach, FL. This one is for cocktail aficionados and foodies alike. The Green Market is smokey, sweet, tart, spicy AND savory, but most of all it is balanced. The Key limes are a beautiful garnish that add refreshing sweetness and contrast to the full red cocktail. Procedure: This cocktails beautiful color comes from the red bell pepper-cucumber juice blend. The bell peppers are sweet and slight bitter and the cucumber is cool and refreshing. To make the juice cut the bell peppers in half and pass them through a juicer. If you don’t have a juicer use an immersion blender or straight blender to purée the peppers and pass the purée through a fine chinois. Do the same to the cucumbers after peeling them. Once you have both juices. Mix them 2 parts bell pepper and 1 part cucumber. The jalapeño infused Finest Call Agave is as simple as placing jalapeño slices into your Finest Call Agave. Put enough jalapeños to make the agave as spicy as you and your bar guests will enjoy. Note that leaving the jalapeños in longer will result in more spice. Now you’re ready to mix. In a mixing tin add the mezcal, Mandarine Napoleon, lime juice, jalapeño infused Finest Call Agave and Red bell pepper-cucumber juice blend. Fill your mixing tin with ice and shake vigorously. Strain into a rocks glass over fresh ice and place several key lime wheels into the glass between the ice and glass. Espresso martinis are almost always a plethora of creams and liqueurs mixed into an almost drinkable sludge that almost always leads to a less than memorable hangover. They’re the kind of thing that make my friend and fellow USBG member Danny Seigel rip his hair out (that and Bloody Mary’s). For me this cocktail is about embracing simplicity. The streets of little Havana in Miami are where I had my first Collada; a simple mixture of cuban coffee and white sugar. 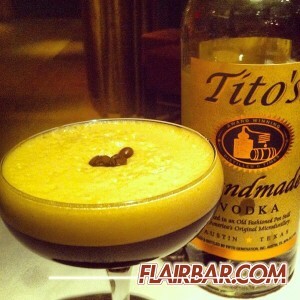 It seems only natural to add a great vodka like Tito’s and call it a day. The key to this cocktail is a great shake so you can get lots of foam. Garnish with three carefully placed espresso beans for a picture perfect martini every time. I guarantee it’s the best espresso martini you’ve ever had. Procedure: In a mixing tin add the vodka, Finest Call Bar Syrup and espresso. Fill your tin with ice and shake vigorously. Strain into a chilled coupe or martini glass. Garnish: With 3 coffee beans.